Two days ago at Sunday, the 20th of January I held my first own Tournament. It was ambitious and it could all have been probably organized better but for my very first try it overall worked out quite nicely. Everyone gotta admit this is probably the prettiest schedule in history. A lot of things could have gone wrong but barely anything did and if I could do it all over again I wouldn't do much different. I wanna thank everyone who participated in it. Especially thanks to ArunP for randomly asking me for access on the schedule in the middle of the tournament and filling in a lot of stuff I probably couldn't have done in time myself. And again shoutout to Bloodred for helping me with the tournament system and also Nina and Celine for helping me with the forum post and a bit with the schedule. 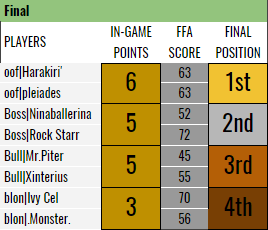 And of course congratulations to Harakiri' and pleiades for very close win in the final. Both of them are now 20€ richer, at least that's the case if pleiades sent wolf the 10€ which weren't meant for him, thanks to ArunP and two other (I think) anonymous donators. It was very stressful and I don't think I ever got as many private messages during the tournament than I ever did before. That's at least my excuse for letting down Roxy with my terrible performance. But overall I really enjoyed it and I'm happy that it's over. Here a link to the schedule. And here a link to the commentated final. And what's the moral of all of this? That counting is harder than you thought. Really good idea, and a lot of fun, really. Thanks also to the donators. If there is in the future another tourney with money in stake, it will be my time to be a donator. Gotta admit this schedule is hot and all features like current time should be added to official tournaments, but the dopest schedule design I ever seen was unbeatably by @Miaoush.